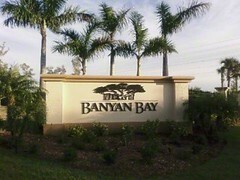 Banyan Bay is a small gated community, located in South Fort Myers off of Winkler Road and South of Summerlin Road. It consists of only 132 single-family homes. The residents here enjoy views of lakes and conservation areas. Bayon Bay, originally developed by Ryland Homes and now D R Horton, is quickly approaching completion with very little inventory available. This community is located in one of Ft. Myers most sought after corridors – close to beaches, shopping, dining and Healthpark. It’s also in the elementary school, the middle school, and the high school district. It’s surrounded by two existing single-family home neighborhoods to the North and South, and the Estero Bay Buffer Preserve to the East and South, which makes this community in a perfect location! Banyan Bay amenities include a community pool and cabana and it’s located off of Winkler Road and South of Summerlin Road. The Homeowners Association dues are $201, monthly. The communities low monthly maintenance fee includes community pool maintenance, individual lawn and landscape maintenance, basic cable/TV service, irrigation system, gate, lake and common area maintenance. Need more HOA information? Check out my Gated Community Resource Guide that includes detailed information about Banyan Bay, including association fee amounts and what comes with community dues. Contact me for more info about this beautiful community! You can also view all current homes for sale in Banyan Bay. Posted on February 28, 2013, in Real Estate and tagged Banyan Bay, Buy a Home, Buyer, D.R. Horton, Fort Myers, http://www.kristenpell.com/, Kristen Pell, Property Guiding, Real Estate Biz, Ryland Homes, SWFL Real Estate. Bookmark the permalink. 1 Comment. It might already have some defects that cold impact the complete house. not find many which have a water heater. Any dark, yellow or green patches could be mold.